Of the three main meals of the day, breakfast is the meal that is most likely to be skipped. Breakfast is the first meal of the day, literally the meal that 'breaks' the overnight 'fast'. It is the meal that the body needs to top up its glucose levels, which is the body's main source of energy. It also fuels the muscles that are necessary for physical activity. If you skip breakfast, you'll have a shorter attention span, be less alert, take longer to react, have low blood sugar and decreased productivity. Formulated with an exclusive blend of selected proteins, vitamins, minerals and herbs. Low in calories, low in fat and a valuable source of fibre. Provides 18 amino acids to help the body function at its optimum level. Now contains Aminogen, a naturally derived ingredient that helps the body break down protein into free-form amino acids. Additional vitamins and minerals. Contains completely non-genetically modified ingredients. Enhanced fibre blend for a smoother, easier mixing shake. Able to be taken hot or cold, this powerful antioxidant beverage also gives you a natural lift in energy. 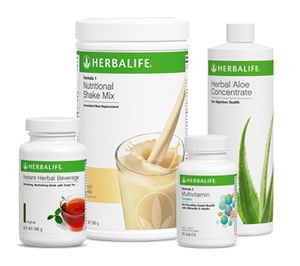 Herbalife's Herbal Aloe Drink assists the body by soothing the digestive system and assisting the natural self-cleaning action of the body.